December 5th – Wine tasting Chanukah party, featuring old world and new world wines. A fun walk-around tasting of smart wine buys from around the world. Enjoy this global tasting, a unique Chanukah celebratory night of wine and fun. We will hear a brief talk about wine from Miriam Morgenstern, VP and Associate Publisher of Wine Spectator. 8:00 PM – 10:00 PM; Members $20, Non-members $30 Music, latkes, menorah lighting, passed wines and cheese. Special thanks to Skyview Wine & Spirits. Thank you to our Chanukah committee: Ellen Lipkis, Chasya Kellman, Sonia Schatzman, Jay Paul, Karen Sutton, and Judy Pollak. 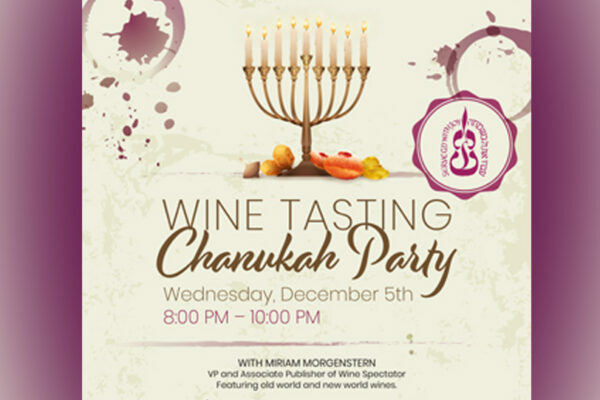 December 5th – Wine tasting Chanukah party, featuring old world and new world wines.